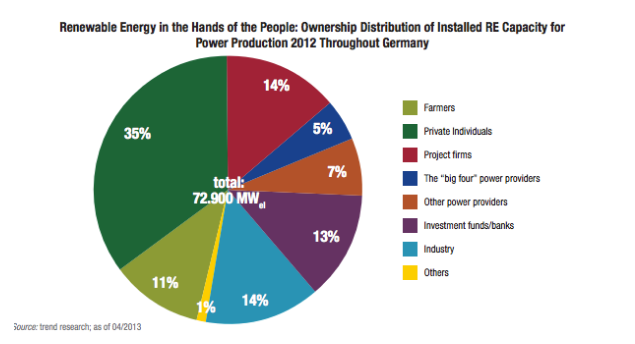 Germany already has one of the highest household electricity rates in the developed world. Power bills of households, shop owners, and small factories in Germany have increased by more than 100 billion euros ($134 billion) as renewable energy met a record 25 percent of demand last year. This increase in renewable energy has wreaked havoc on the electric utilities in Germany. Because of renewable energy’s subsidized production cost, wholesale electricity prices in Germany dropped 60 percent since 2008. The nation’s biggest power producer, RWE AG, reported its first loss since 1949 last year as utility margins are being squeezed because German laws give green power priority on the electric grid. Germany now has the second highest residential rates for electricity in Europe, second only to Denmark; just a decade ago, Belgium, the Netherlands and Italy had higher rates than Germany. Between 2005 and 2010, the annual increase in residential electricity rates in Germany was 4.3 percent. Since the tsunami hit Japan in 2011, the annual increase was 7 percent because Germany increased its solar and wind subsidies to spur their development so it could close down eight of its nuclear reactors. Germany’s 40 million households and other taxed consumers paid 106 billion Euros between 2000 and 2013 to renewable energy producers. The government estimates it could cost as much as 1 trillion Euros by 2040. Due to the higher prices, household electricity consumption has declined by about 1 percent per year since 2005. The economic toll on the country and its residents has made the government recently cut renewable subsidies by 29 percent on average to 120 Euros a megawatt-hour. Coal consumption increased 68 percent from 2010 to provide the needed baseload power that intermittent renewable technologies cannot supply since their output is dependent on the sun shining and the wind blowing. Germany’s electric utilities earn more from generating electricity from coal than they do by using natural gas since most of its natural gas has to be imported, much of it from Russia. The utilities make around 5 Euros a megawatt-hour by generating electricity from coal despite the environmental penalties, and they lose more than 17 Euros by generating electricity from natural gas based on current prices for electricity, fuels and emissions costs. As a result, the average usage of German gas-fired power plants declined 31 percent since 2010–from 3,333 hours in 2010 to 2,306 hours in 2013. Germany’s feed-in tariff requires distributors to buy electricity from green generators at fixed prices before buying power from other sources. By forcing renewables to be purchased, the tariff deprives traditional generators of revenue and makes it harder for them to forecast demand for thermal power plants that require millions of Euros of investment and years to build. As a result, Germany’s electric utilities have had to rely on cheaper coal plants when renewables cannot handle the demand. Germany’s move to intermittent renewable technologies has resulted in increased coal use, which has added to its carbon dioxide emissions. Between 2005 and 2010, Germany’s carbon-dioxide emission reductions from power plants averaged an annual one percent decline, but they increased by the same amount between 2011 and 2013 as nuclear plants were taken off-line and coal was the only profitable technology to back-up wind and solar power. As a result, it is estimated that Germany’s 40 percent reduction target in greenhouse gas emissions from 1990 levels by 2020 may be missed by as much as 7 percentage points. After pouring billions of Euros into renewable energy, the Germans are left with spiraling power prices, energy market chaos and, collapsing companies. Deriving a large proportion of energy from renewables is proving extremely costly; the government indicates that it could cost one trillion Euros by the end of the 2030s. Its renewable energy program has devastated its utility companies, whose profits from power generation have collapsed. Germany’s coal renaissance and its increasing carbon dioxide emissions should be a cautionary tale in what happens when expensive intermittent renewable technologies are being promoted and nuclear energy is being phased out without the economic realities of the transition being properly assessed. Germany’s energy-intensive industries get exemptions from the renewable energy subsidies.